VINH, Vietnam (July 23, 2012) - Global Grins has helped bring smiles to thousands of people by donations given to the Pacific Partnership 2012 (PP12) mission to hand out during four mission port visits between May and August this year. Global Grins is non-profit organization that provides toothbrushes and oral hygiene supplies to different places that are in need of the supplies all around the world. 100,000 toothbrushes were donated by Global grins to the PP12 mission allowing the dental team to pass out thousands of toothbrushes as each event they attended. When asked about Global Grins involvement with PP12, Joselyn Miller, President of Global Grins, said that Global Grins is very proud to play a small role in Pacific Partnership's mission. “We donated 100,000 toothbrushes to the mission, which are being delivered to those that Pacific Partnership is serving in Southeast Asia,” said Miller. 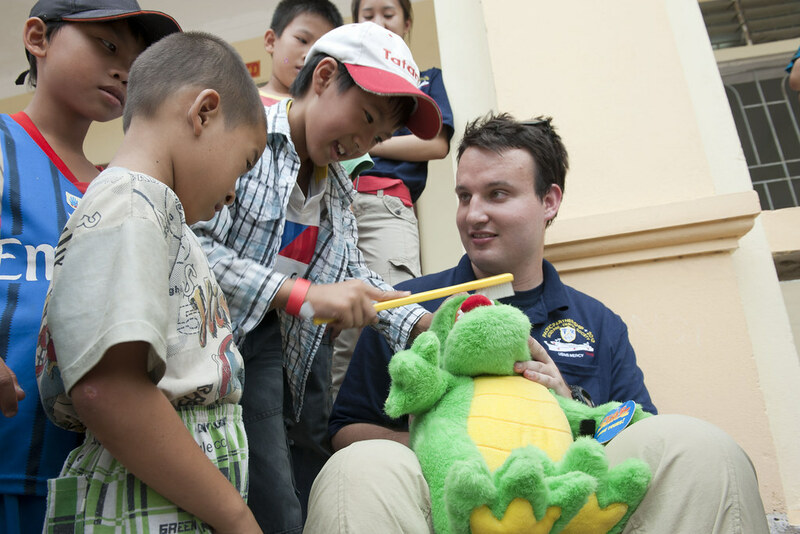 Now in its seventh year, Pacific Partnership is an annual Pacific Fleet humanitarian and civic assistance mission U.S. military, host and partner nations, non-governmental organizations and international agencies designed to build stronger relationships and disaster response capabilities in the Asia Pacific region.